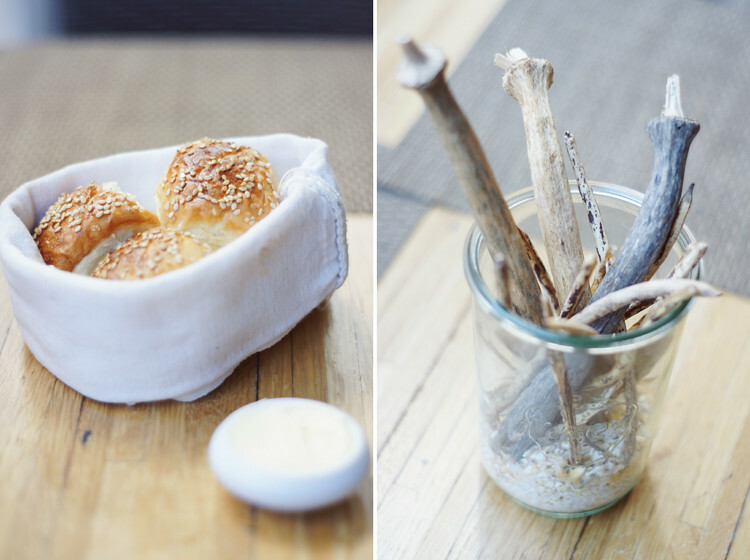 Executive Chef Sean Brock is transforming the way you think about Southern food. His philosophy is simple: “If it ain't from the South, it ain't coming through the door!” A restriction like that can put some severe limitations on a fledgling restaurant, but it's a commitment that he wholeheartedly abides by. From what I've read, they didn't even allow olive oil into HUSK until they found a purveyor in the state of Texas. What's that you say? Texas isn't in the South?! Well, technically, it is since it's below the mason-dixon line, which is where all the ingredients must come from in order to make it to one of the tables at Husk. The fairly new restaurant is situated on a magnolia-shaded side-street in the heart of Charleston's historic district in a very inviting Queen Anne home built in 1893 that has been fully restored. I just love those types of restaurants that make you feel as if you're visiting a relative to sit down and have a meal. It isn't as intimate a setting as Simplicity at The Mast Farm Inn, but the comfortable space was bright and airy, and the floor-to-ceiling windows filled the dining room with the most gorgeous light. While I would have loved to sit inside the main dining room, we were ushered to the 2nd story porch to dine alfresco. The weather was superb. We got lucky! This nationally acclaimed restaurant has only been open since the Fall of 2010 yet it has won numerous awards between now and then. The most notable so far is the title of #1 Best New Restaurant in America by Bon Appétit Magazine. That's a pretty prestigious accolade right there, wouldn't you agree?! I think that Chef Sean Brock is used to the attention, though. He's become quite the celebrity in Charleston from his time spent at McCrady's, another highly acclaimed fine dining establishment in town. But Husk is his baby. Or so that's the impression I've gotten. His intention upon opening the restaurant is to place more emphasis on the ingredients used & the folks that cultivate those products and produce instead of having the spotlight placed on himself. He clearly has a deeply rooted passion for, not only the South, but Southern food, and it definitely shines through in many different ways here at Husk. Something highly unique about the dining experience at Husk is that the menu changes daily. Yep, every single day! That seems like quite a challenge, indeed. Not to mention how much time and effort it requires to manage such a lofty mission. However, they are handling the task pretty well from what I experienced. So, why does the menu change everyday? Well, as I mentioned earlier, they are bound by what is currently available to them using only ingredients from the South. While it seems restricting, Husk's stance is that it's a necessity! To them, there is no other way. I really admire a place that's willing to take such a risk for the sake of preserving what seems to be a bygone era. To those that don't know any better, this restaurant is being touted as revolutionary because of the pledges they have made. However, what people seem to forget is that there was a time when people had to eat what was on-hand. There weren't grocery stores filled with aisle upon aisle of pre-packaged food at our disposal like today. You ate what you grew, or you didn't eat! Simple as that. While the farm-to-table mentality seems like a fad that has only recently become more prominent in popular culture, it's really just a movement that is being revived by those who appreciate simplicity. People like Chef Sean Brock. Our recent dining experience was brunch before leaving Charleston to head home. We had ventured there the day before, but they weren't open yet, so we sadly had to go elsewhere. However, I was determined to eat at this restaurant after receiving a recommendation from a friend on the WW Facebook page. It ended up being the perfect way to round out our weekend getaway! So, yeah, let me get to the best part...the FOOD! After pouring over their menu, and not being able to choose what I wanted, I decided to ask our server what she recommended. Actually, I asked her what was the best-looking dish they had today, which elicited an interesting look, rightly so. I ended up going with her suggestion, which was the Monte Cristo. It included VA Lamb BBQ, TN Buttermilk Cheddar, fried egg, Surry Sausage, and Potato Hash. The flavor of the Lamb BBQ was incredible; it was smoky with a hint of sweetness. I would have been happy with a plate piled with nothing but that! 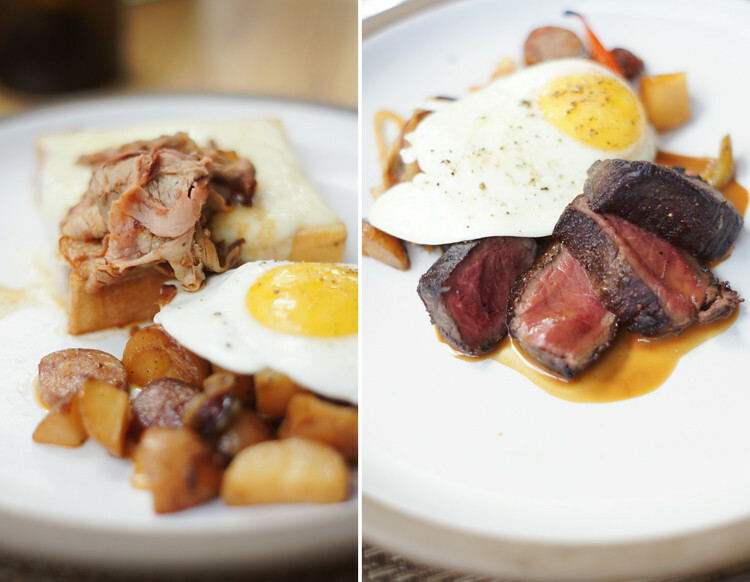 Cody ended up going for the TX Wagyu Sirloin, with a sunny side up egg, VA Sausage and Confit Potato Hash. The presentation of this dish had me drooling, and reconsidering my own breakfast order even though I thought mine was pretty, too. Luckily, he was nice enough to offer me a bite. The Wagyu Sirloin was so tender. Basically, it melted in your mouth—makes me salivate just thinking about it! Talk about things melting in your mouth, the buttermilk benne seed dinner rolls they brought out prior to these dishes were also amazing; I didn't hesitate to slather on the savory homemade pork lard butter they supplied us with. To say the least, it was a highly satisfying meal that I enjoyed immensely. I only wished that I had room for more! If you're interested in finding out more about HUSK, here is a link to their website. QUESTION: What do you think about Husk's philosophy? Would you say that it's flawed or awesome? I sat there frozen in disbelief as Cody knelt down in front of me with a tiny box in-hand. Looking around the room in the busy restaurant at the people watching this happen, I said, “Are you effing serious? 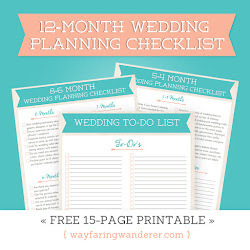 !” Tears immediately began streaming down my face before the moment really even sunk in. As I sat there crying uncontrollably with my mouth wide open, utterly speechless, I failed to hear the remarks he had so carefully crafted and practiced. My mind was mush. I melted into Cody's arms before I even mustered any sort of coherent response. He stopped and apprehensively asked, “So...is that a yes? !” All I could do was shake my head up and down and quietly utter a “UH HUH," as I began sobbing even harder. You think that you'd be ready for a surprise like that when you've been waiting 5 ½ years for it to happen. But you're really not. I thought I'd be jumping for joy. I thought I'd scream out loud in an attempt to get everyone's attention, but I was just in shock. It occurred to me that it was somewhat odd that Cody wanted to plan a trip to Charleston. You see, we had spent October traipsing all over the Eastern US, and the last thing I wanted to do was take another trip so soon. However, he was adamant. That should have tipped me off, but it didn't. Getting engaged was the furthest thing from my mind because I was not going to get my hopes up only to be disappointed. He kept calling it a “girlfriend appreciation” weekend, which I thought was really sweet. 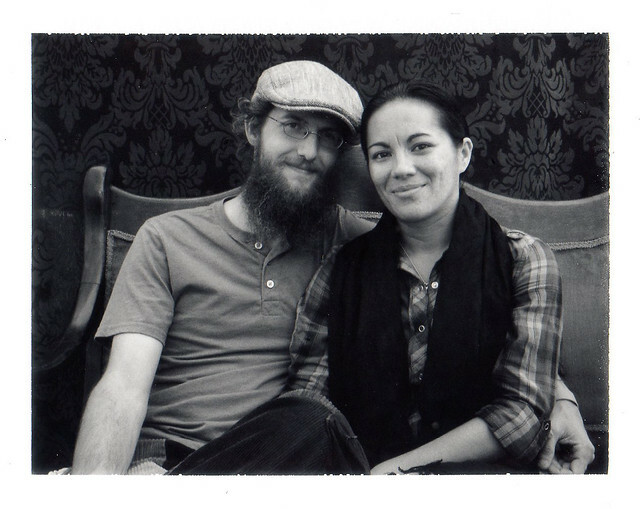 In the 5 ½ years that we've been together that's never happened. That should have tipped me off, too, but it didn't! My mind was elsewhere, I suppose. I'm glad, though, that I decided to let go and allow the trip to happen. Can you imagine if I said NO after all the preparations he made?! Talk about being disappointed. 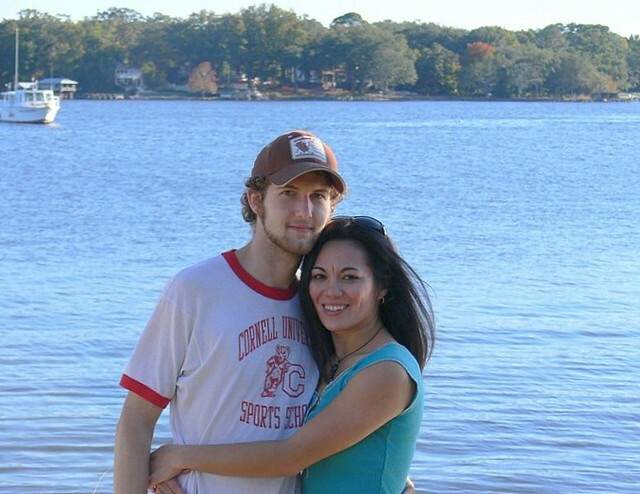 I'm sure that he was really relieved when I finally agreed to go on the quick getaway to Charleston. Who knew it'd take so much arm twisting to get me there?! When he presented the ring, I was a little baffled by its appearance. To be completely honest, I was thinking, “WTF?! Why is it so weird looking? 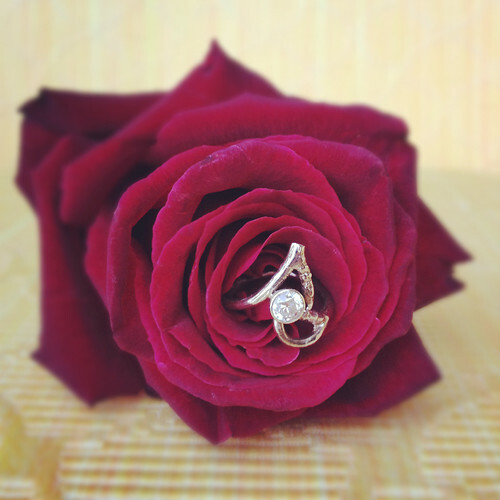 !” The setting was askew and quite odd, nothing like the typical engagement rings I've grown accustomed to seeing. I think that the confused look on my face said more than the words I spoke, because Cody said, “If you're not happy with the way it looks, I can get the guy to recast the ring.” Secretly, he was hoping that's not what I wanted. The idea of being able to redo it was somewhat appealing, but I knew that wouldn't be right. He then told me the story of how he so thoughtfully brought this token of love into existence. It began with his idea to have a ring made that had the look of a twig. We are both so connected to trees and nature that it seemed like a novel idea. The problem was finding someone that would agree to carry out his vision. From what I was told, there were countless emails and calls made to numerous jewelers only to be told that they wouldn't be able to help him. Thankfully, that didn't stop his quest to find someone who would be willing to work with him and the diamond taken from his great Aunt's ring. It wasn't until a couple of months ago while talking to his boss that he got a recommendation for a local jeweler. After meeting with John from DogsKin Studios, he finally found someone who would be willing to help him bring this ring to life. The ring was cast from a dying birch tree that I spotted while Cody and I were walking around Bass Lake on 09.10.11. We stopped to identify this tiny budding tree that was losing a battle to the beavers who had destroyed it. Finding a tree budding at this time of the year was pretty rare, but happened to be exactly what Cody was looking for. From what he told me, he took the opportunity to slip one of the twigs down his shirt sleeve without my knowledge, so that he could take it to John, so he could start creating the engagement ring. After hearing the story of how this ring came to be, I began to love it a little bit more. I realized that his idea of a perfect ring was, in fact, pretty darn perfect. He revived a diamond from a family ring, melted down his class ring to create the setting which was cast from a twig that he selected while we were on a walk?! I mean, come on! It is truly one-of-a-kind and can really never be replicated or replaced. That's special. Knowing what he put into it makes me feel special, too. After all the tears and unfounded fears that I had about reaching this level of commitment in our relationship, I now know that this was exactly the right time for this to finally happen. 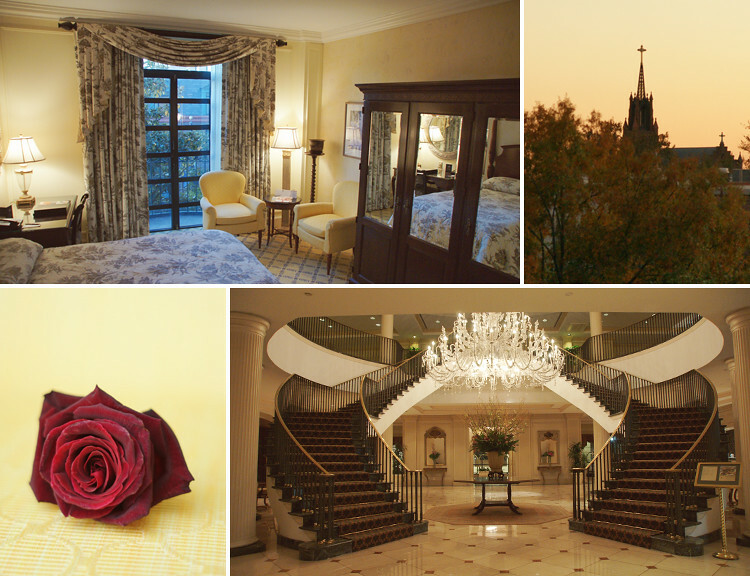 He proposed on 11.11.11 in the city of Charleston, SC, which happens to be one of our favorite places, with an engagement ring that embodies our love in the most perfect way possible. A lot of care and thought was put into this proposal, and I feel extremely lucky to have someone like Cody by my side in this life. Someone who's been with me through the hard times and life-altering moments. 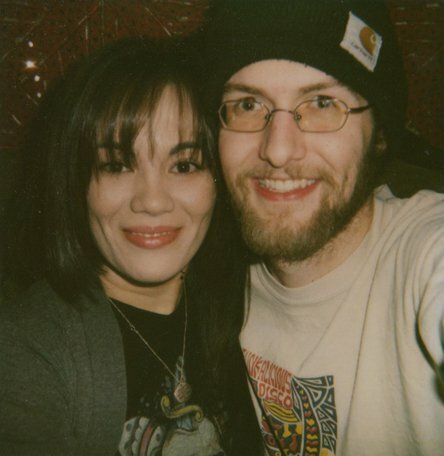 Someone who loves me and accepts me for who am I no matter what fickle mood I may be in at the time. Our relationship is far from perfect. I am far from perfect, but we can overcome the imperfectness together. While I am not ready to set a date or start planning a wedding, I am eagerly looking forward to and am excited about spending the rest of my life with the most amazing partner ever! Question: Tell me...How do you keep love alive in your relationship? 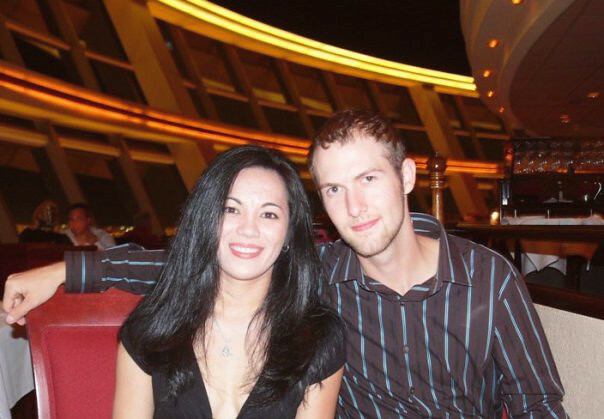 What advice do you have for a couple who are in it for the long haul? 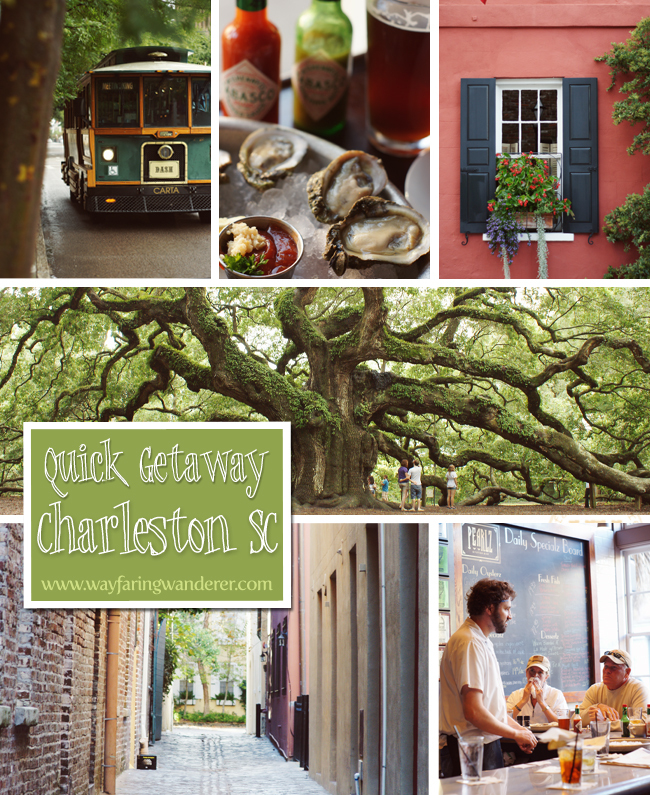 Everything you've heard about Charleston, SC is absolutely true! I'd be really surprised to hear if you hadn't learned anything about this charming city yet because it's pretty popular. The Holy City entertains nearly 4 million visitors on an annual basis. Good thing it's large enough to accommodate all those who choose to travel to Charleston, SC; it is the second-largest city in South Carolina! This town offers all sorts of different experiences depending on what appeals to you. Trust me, you won't run out of things to do in this bustling town no matter what you're into. While a weekend getaway is sufficient to explore some of the highlights of Charleston, SC, it's not nearly enough time to experience everything they have to offer from the amazing local restaurants found around every corner, to the museums, churches, and other architectural delights to see throughout the town. The question really should be, “When is there NOT a good time to go”, because you can visit Charleston during any season and be pleasantly surprised by what you can discover. Late fall had lovely weather during the day with crisp, cool nights after the sun went down. A far cry from the dead heat of summer I experienced when visiting last year in August. The only way I'd tell you to go during the summer is if you planned on spending most of your time at a Charleston, SC beach! Otherwise, you'll be going from one air conditioned store to another for a reprieve from the heat—I speak from experience. My most recent trip to Charleston mid-November included accommodations that were a whole lot different from what I experienced previously. Mainly, because this trip wasn't planned by me (I'm cheap). Cody was the one who made all the arrangements this time around, which is a little out of the ordinary for us because I'm typically the planner. I was downright shocked when we were pulling into a hotel that was right in the heart of downtown Charleston! And not just any hotel either, we would be staying at the CHARLESTON PLACE, which, from what I could tell on the outside, was as posh as it gets! We were greeted by valets and ushered in by bellhops. I didn't know what to do with myself. I was floored. All I could keep thinking in my head was, “How much did he have to pay for this place?!" haha But he wouldn't divulge that information no matter how many times I asked. After I got over the initial shock of how fancy this hotel was that we would be staying at, I was railroaded yet again by how beautiful our room was. Seriously, I don't get to stay in places like this normally, so I'm easily impressed. We even had a balcony that overlooked the courtyard below that gave us a nice little view of a small portion of the city. The bathroom was ridiculously luxurious, too, with marble tiles on the floor and bathtub walls. It was almost like stepping into a magazine. I felt so spoiled. Aside from how amazing this place was, the staff was also super friendly, courteous, and always asking how they could help make our stay more pleasant. A girl could certainly get used to that sort of treatment, for sure. One of the main reasons we love Charleston so much is due to the fabulous restaurants that can be found without even really looking very hard. We had some terrific food during our last trip, and we were very much looking forward to revisiting some of our favorite restaurants as well as try a few new ones while we were there. When it came to breakfast we were quite lost on where to go, so we basically stumbled around until we found something that tickled our fancy. After stopping in to check out the menu at several different places, we settled on breakfast at a place called TOAST. I think that one of the major reasons people eat at Toast is because they are home of the bottomless mimosa. Truth be told, that was probably the deciding factor of why we were eating there! Haha Although I have no complaints whatsoever about the food I ate. The “Eggs Meeting Street” was pretty delicious! It had a fried green tomato topped with a crab cake, poached egg and Lowcountry remoulade sauce, served with home fries. I ordered it because it sounded so weird, and I just had to get a taste. The tangyness of the flavors in this dish may not appeal to everyone, but I thought it was very good! Based on a recommendation someone gave on the WW Facebook page, we found out about a fairly new restaurant in Charleston called HUSK. This restaurant was named 2011 Best New Restaurant in American by Bon Appetit Magazine. So, what's all the hype about? 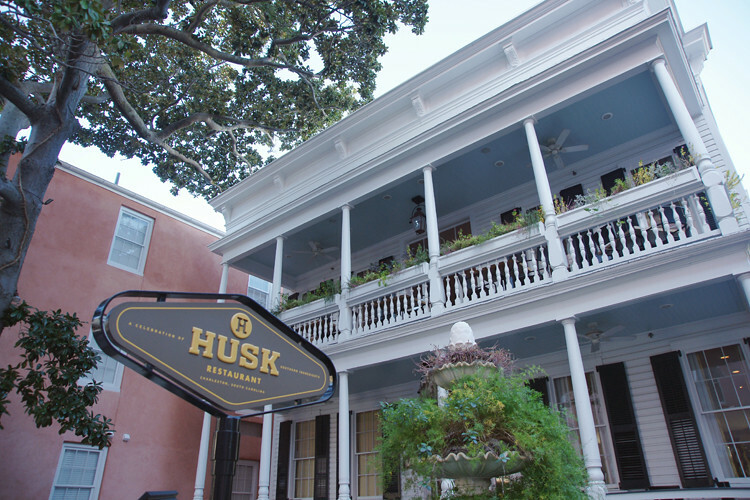 Well, Husk has decided to do things a little differently than the typical restaurants you'll come across, not just in Charleston, but anywhere, really. The menu at this restaurant changes daily, and they take being a locavore to a whole new level with their commitment to only serving ingredients procured from the South. After pouring over their menu, and not being able to decide on what I wanted, I decided to ask our server what she recommended. Actually, I asked her what was the best-looking dish they had today, which elicited an interesting look, rightly so. I ended up going with her suggestion, which was the Monte Cristo. It included VA Lamb BBQ, TN Buttermilk Cheddar, fried egg, Surry Sausage, and Potato Hash. I've grown accustomed to seeing a plate piled with a number of different ingredients, so to have this lovely plate presented to me in such a simple fashion was really out of the ordinary. It doesn't look like much, but looks are certainly deceiving in this instance, because the food was fabulous! I can't wait to go back and eat at this restaurant the next time we're in town! Aside from our eating exploits and the time spent at the amazing hotel, there wasn't much time left to do anything else, really. A weekend in Charleston, SC isn't near enough time to explore everything this multi-faceted city has to offer. However, you'll definitely want an excuse to come back and discover more! If you'd like to find out more about Charleston, SC, here is a link to the visitor's website. If you're looking for things to do in Charleston, SC, I have included some links in this post to related articles from my past trip that could be useful (look for the red text above). I would have included some here, but the post was getting entirely too long! Another thing missing from this post is the "bonus surprise news" I promised to share, which I fully intend on doing, but I'm going to save it for Thursday because it deserves more than just a blurb! Question: Have you ever been to Charleston, SC? What's your favorite thing about this city? If you've been following Wayfaring Wanderer for any period of time, you know that I have a slight (ok, BIG) obsession when it comes to food. Not only that, but I'm also pretty crazy about taking pictures of the food that I consume when I'm eating out. Yeah, I can cause a scene at times, but I'm used to being “that guy” by now. It comes with the territory of being a photographer. Due to my penchant for taking pictures of and eating food, I decided to have a weekly feature here on Wayfaring Wanderer called Foodie Friday! 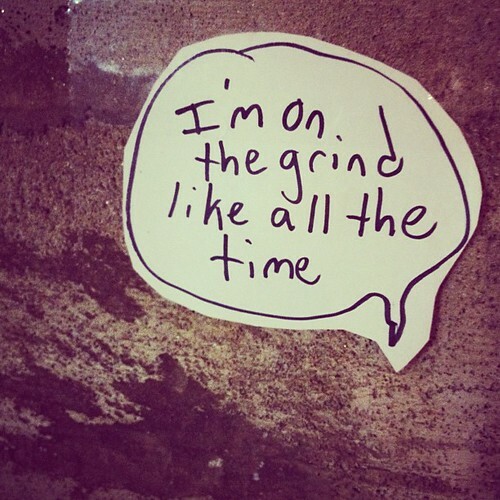 I've been doing it off and on for a while now, but I'm ready to make it something that I do every week without fail. There's no shortage of food photos laying around on my hard drive, and I'm always going out to eat it seems, so I have plenty of food pictures to share with you. Many of my food photos don't make it to the Wayfaring Wanderer Facebook page or my blog, though. Instead I share them on a website called Foodspotting most of the time. Foodspotting is a fairly new website that is quickly growing where you share food recommendations. 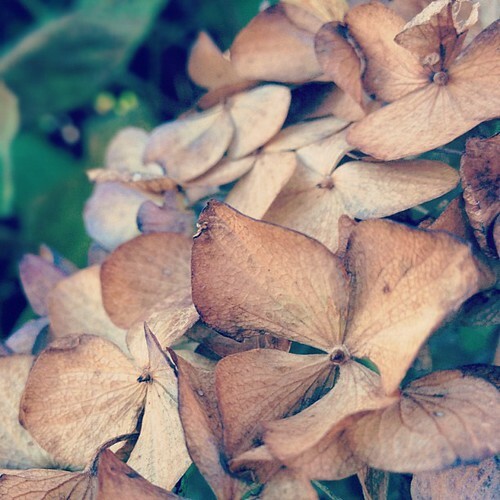 It's centered around photos, which I really enjoy perusing when I am so inclined. It's like a social network for Foodies, basically. You can follow people, leave comments, etc. They have an app, too, which makes it easy to upload spottings on-the-go. For Foodie Friday's I don't always plan to share my Foodspotting photos. It's possible that I may review a restaurant(s) or offer food photography tips. I'll try to keep things interesting! This week, however, I will be sharing some of my most recent spots that have been posted on my Foodspotting profile. 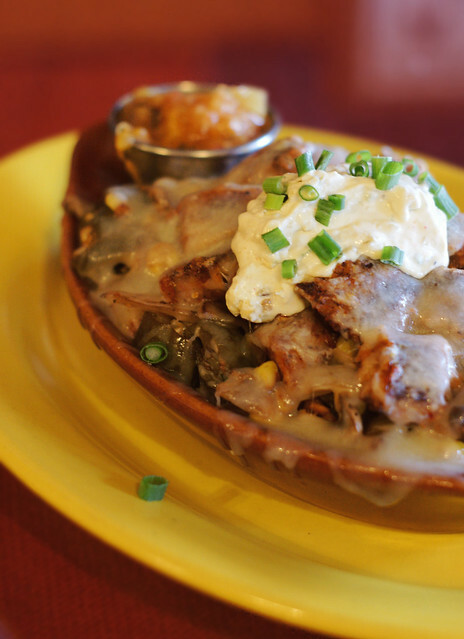 Mojave Boat: coconut rice, red beans, blackened chorizo sausage, grilled jalapenos, roasted corn, caramelized onions, mushrooms, and broiled jack cheese topped with jalapeno cream cheese and scallions. This place is one of the Boone restaurants that I love, but don't eat at often enough. You see, it's not located downtown. It's off the main strip, which is why I don't always think about eating there. When I do, though, I catch myself wondering why I don't have lunch/dinner there more often! They have an extensive menu, which is awesome, but also makes it difficult to decide on what you want to eat. I typically go for the “Boats” or burgers, and I've yet to try anything that I didn't thoroughly enjoy. The new Mellow Mushroom that recently reopened here in Boone is bigger and better than the old one. It's quickly become one of my favorite places to go in town. Yes, they are always busy, but for a very good reason. The food is phenomenal, and the service is always top-notch. We love everyone in that place. The people are so friendly! Dinner and drinks there can turn into a 2-hr affair, especially if we get seats at the beautiful bar that Cody had a hand in crafting. 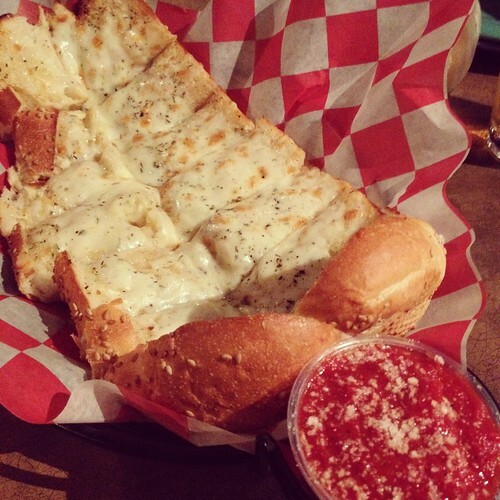 It's impossible to pass up an order of cheesy bread anytime we go because it's just so dang good! This restaurant has been in business for quite a while, and I've been meaning to have dinner there at some point. However, I only made it there recently. I met up with a new friend, Courtney from Yoga G33k, and we sampled a couple of items from the menu while enjoying some cocktails at the bar. It's mainly a tapas restaurant, though, and only has a small bar area. The vibe in that place is very different from a lot of the other places you will visit in Boone. It has more of a metropolitan feel in contrast to the more rustic places you will find around town. The night that we visited was pretty quiet, but we enjoyed ourselves, the cocktails and food we had, too. I'd definitely like to go back and try more of their menu! How often do you usually eat out during the week? I was recently contacted by a representative from the YMX by Yellowman Clothing Company about testing & reviewing a piece of their performance wear. 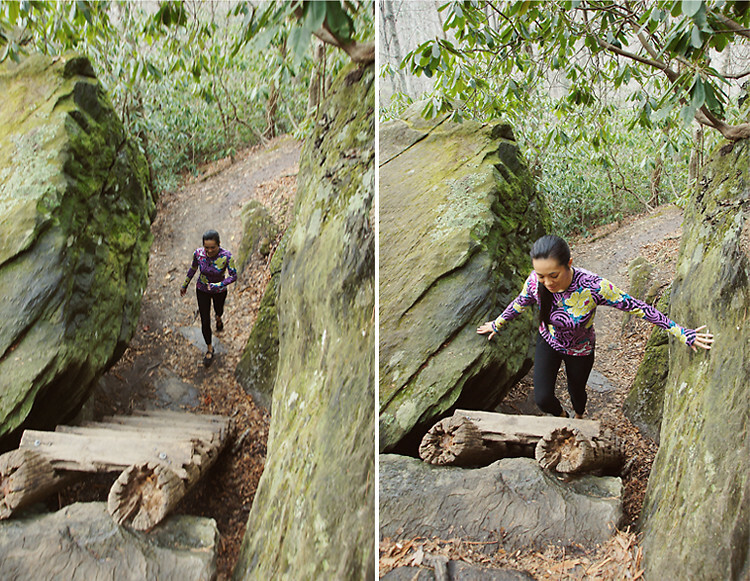 Once I received the item, I decided that the best way for me to test its mettle was to wear it on my favorite 5-mile hike, the Boone Fork Trail, to see how well it held up. This is my way of telling you this is a sponsored post, and that I was given this shirt so I could write a review. However, the views and opinions within are my own. When I was initially contacted by the company, I, of course, checked out their website and found other reviews to see what they were all about, and to determine if it would be worth my time despite the fact that I would get a complimentary shirt out of the deal. I mean, I don't want to do it just to do it. I want to make sure that it's a company that I can stand behind, you know. What I found was that they started out making clothing with tattoo designs on them before jumping into the sports wear arena. I can't say that the vivid prints and detailed artwork would be something that I'd typically purchase on my own had I been shopping for a long-sleeved shirt, but I do think the designs are very eye catching and beautiful. I got to choose between 3 different styles, and I went with the one that had the most black in it, naturally. What I liked right off the bat once I had the shirt in my hands was how soft and silky the material was. It was also extremely lightweight, which is a huge plus. And I even came to appreciate the artwork more, too, once it was in front of me and not on the computer screen. The burst of color coupled with the detailed graphics made it a showstopper, for sure! One major benefit to wearing this type of garment is that it's very versatile. Not only is it great for any sport, it's also great for leisurely activities as well. The MadKool fabric made exclusively for YMX, and Yellowman is special in many ways. It's breathable and stretchy, yet it still maintains its shape, which made it super comfortable to wear. This might be TMI, but I perspire quite a bit when I'm being athletic...or sitting still, so I liked the fact that this material wicks away moisture. I was expecting it to be wet in certain places after working up a sweat during my 5-mile hike, but I didn't have that problem with this piece. The shirt managed to stay dry during the entire hike! Fitness fashion isn't something that I think about too often. Most of the time I just throw on whatever without giving much thought to how presentable I might be while I'm doing something athletic. However, I'm sure that many other people put more thought into how fly they look when they're picking out gym clothes to wear for a workout. Not that there's anything wrong with that. I just don't give a hoot. However, what I do appreciate are pieces that are comfortable and functional, not just pretty to look at, and that's exactly what I found with the Flower Clouds Sun Tee from YMX. While it was different for me to wear something that stands out so much, I did feel as though the shirt lived up to the expectations I had after reading the claims about its performance. I'm happy to have this wearable work of art that I can use when I'm being adventurous or when I'm out running errands. It'll definitely become a staple in my wardrobe! Looking to add a piece like this to your active apparel collection? Well, YMX has generously offered to throw in a giveaway for this sponsored post! • To enter, all you need to do is refer a friend to the Wayfaring Wanderer Facebook page. • Share a link to the WW page on your wall & don't forget to tag WW in the status message you write. Be sure to ask friends to visit & “LIKE” the Wayfaring Wanderer page, so that you can have a chance to win, and let them know that they can enter, too! • The friend(s) that you refer should write a post on the WW Facebook wall that says [YOUR NAME] sent me, so I know who gets the credit! FYI - I won't count the entry if this part isn't completed. • For each person you refer to the WW page, you will receive one entry! • Obviously, this is a shirt for the ladies, but that doesn't mean dudes can't enter, too! • The giveaway will end on DECEMBER 7th (Midnight EST) and a winner will be announced on the 8th. • (1-extra entry) Tweet about this giveaway. I'm @wayfarinwandrer on twitter. Be sure to tag me in the tweet & include a link to this post so that I know this was completed! here or on the FB page. Good luck! Here's a fun fact: My first blog post was published on June 26th of 2006. That means that I've been blogging on Wayfaring Wanderer for a little over five years now. Sheez louise, that's a long time! When I started blogging, I had no clue as to what it was all about. Honestly, I don't even remember how I learned about blogs or what actually made me start one. What I do recall is that blogging was something I started doing as a means to substitute what I was no longer able to do, which was rock climb. Wayfaring Wanderer didn't even start out as a travel blog, really. Over the years, WW has taken on many different forms and has gone through several transformations in the process of my personal growth. There's a lot that I learned during this time, I've healed in ways that I never really expected (physically, mentally, and emotionally), and have had some crazy dreams come to fruition since the inception of my lil' ol' blog. From my solo journey to Oahu, Hawaii to the all expenses paid foodie blogger event in San Diego furnished by Sony Electronics, I've had a lot of awesome things happen over the years. Blogging has been one of my most favorite outlets, but it's also come with its fair share of struggles along the way, too. What I love most is how I can look back on where I used to be, so that I can better appreciate where I am right now. Without acknowledging where you came from, it's hard to grasp how far you have come. At least, that's how I feel about it. Blogging has made that possible for me and that's another reason why I love doing it. When I get all sentimental and start sifting through my archives, I cringe at some of the old photos and how I mutilated them in photoshop with unnecessary filters and adjustments. Now, I barely bother making any adjustments to my images in photoshop. And my writing, oh lawdy, it was atrocious! However, with time (and practice), I got much better. To date, I've published 537 blog posts, so I'd hope that there were some lessons I learned along the way! Back in the day, I used to blog 5 days a week, which seems completely absurd to me now. I'm lucky if I can manage to publish one blog post a week. I've gone through phases where I'd blog a whole lot and then taper off to nearly nothing only to come back again full force. There's been a lot of up and down when it comes to blogging for me. It's easy to get burned out. If you're a blogger, you know! One thing I do know is that I've never given up on it entirely. I couldn't. For some crazy reason, it means too much to me to keep it going that I couldn't bear to quit all together! When I go quiet, it's not for lack of things to blog about, because I have a list of potential posts that's at least a mile long. And I'm always going somewhere fun and taking pictures along the way, so material is plentiful. In all honesty, I probably have enough stuff to blog about for the next year if I planned things out properly! There are so many places I meant to blog about, but never made the time to do so. Making time is one thing that is extremely important when it comes to putting together posts, and that's exactly where I've failed lately. I just haven't made the time. It's not that I've been o-so-busy. The truth is that I just haven't set aside the time required to get the job done. Another thing that I let cripple my ability to blog is just the fact that more eyes are reading my posts than ever before, and it's slightly overwhelming at times. You know, it was easier to blog when you knew that people weren't reading what you had to say. However, now that I have regular traffic, things have changed. As a result, I've become slightly more judgmental of what I produce. 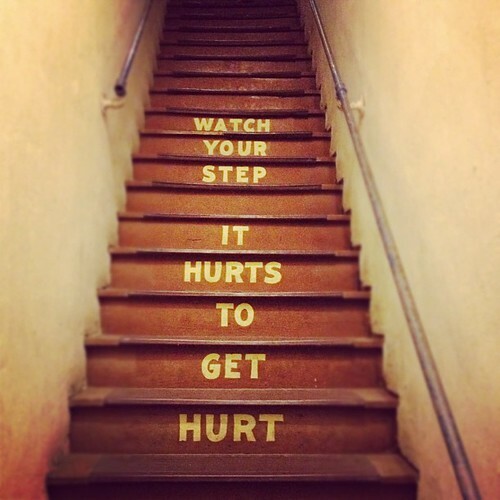 You'd think that it'd get easier over time, but that's not always the case. The problem is that I need to stop being so critical, and just put it out there! Who cares who does and doesn't like it, right?! Just get it out there so that opinions can at least be formed one way or the other. One of my main issues with inconsistency is that I've never really come up with a schedule for my posts. I just sort of do them on the fly whenever I feel like it, which isn't the best way to approach blogging. That is, if you want to build your following and keep people coming back for more. After all this time, I finally realize that, and I'm prepared to do something about it. One thing that I need to revisit is the direction and design of my blog. The current layout is about 2 years old, and it doesn't really feel like me anymore because I've expanded my adventures beyond my own backyard. Since I've graduated with my graphic design degree, I think it's time to redesign WW, so it suits the type of traveler I am, not the traveler that I used to be 2 years ago. While I'm working on the Wayfaring Wanderer redesign, I will also be working on bringing you more content consistently. My goal is to blog at least 3x's a week with regular features. People seemed to enjoy the “Choose Your Adventure” series I experimented with last month, and I'd also like to revive “Foodie Fridays" because I'm always eating good food everywhere I go, and I would really like to share with you. If you have any ideas, throw 'em my way! I'm far from being perfect when it comes to blogging, but I genuinely want to be better than I have been. One of my favorite things to do is share my photography and stories with you in hopes that it will inspire your own adventures close to home! If there is anything, in particular, that you'd like to see on WW, I'd love to hear any suggestions you may have. Please feel free to share here in the comments or on the WW Facebook page! Have you thought about Holiday portraits for the family, but have yet to make any arrangements? Look no further! 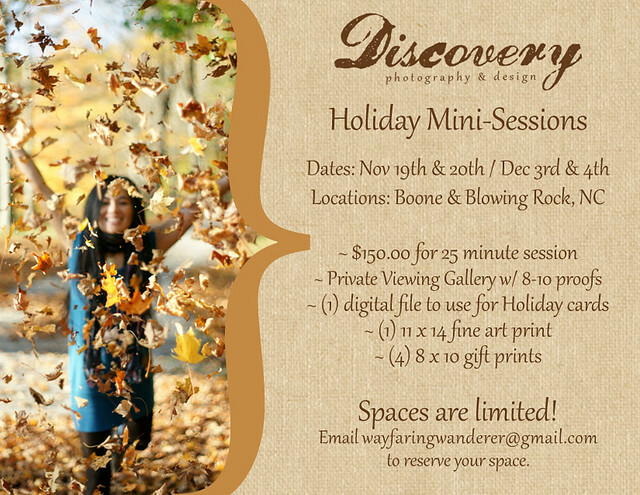 For a limited time, I'll be offering Holiday Mini-Sessions here in Boone, NC and Blowing Rock, NC, and I'd love to photograph your happy family. This is a quick and easy way to get your family portraits done for the holidays before things begin getting crazy! Contact me today for more information and reservations. What used to be a struggling logging town back in the late 60s, Helen, GA has since been revamped to simulate an alpine village in order to promote tourism. It's not quite like what you would find in Germany, but the town has a unique look that captivates many visitors. You'll find over 200 specialty and import shops lining the main strip offering everything from cuckoo clocks to homemade candies. Dining options are also plentiful and range from German-fare to southern food. This quaint little town is far from fancy, but it offers a great deal of excitement with lots of entertainment and outdoor activities to keep you occupied. While there is much to see and do when you are there, it can be experienced in a day if your time is limited. Located in the foothills of the Blue Ridge Mountains, Helen, GA is only a 1.5-hour drive from Atlanta, GA. 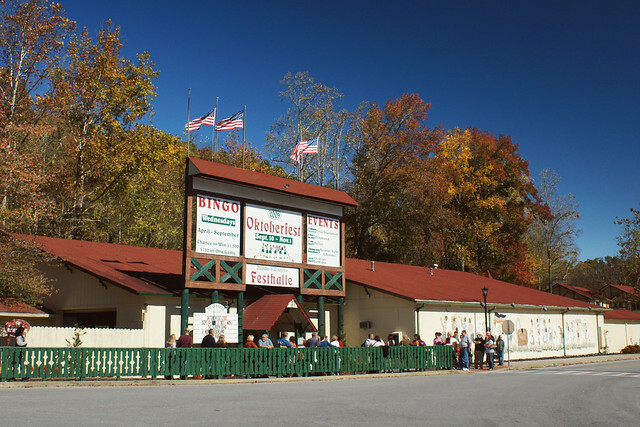 The best, and busiest, time to visit is during their annual Oktoberfest event that runs from the end of September to the beginning of November. (Apparently, it's the longest running Oktoberfest celebration in the south.) If you time it just right, and venture to the town in late October, you can witness the fall leaves at their peak. Keep in mind, though, that the place will be packed with other tourists who are also hoping to catch a glimpse of the beautiful scenery, too. When Cody and I began staying in Helen, back in 2008, we opted to camp out at the nearby Unicoi State Park to keep our costs low. If you want a campsite, though, it's best to reserve early because they are often booked solid during this time of the year. If camping isn't your thing, you also have the option of staying in their lodge, which is a lot like a hotel. While not walking distance to town, it only requires a 5-minute drive to reach the center of the city, so it's pretty conveniently located. In the last two years, since we began inviting friends, our alternative to staying in the state park was to rent a cabin in Helen, GA. When you have a larger group of people, it makes more sense and is a whole lot more cost effective when compared to local hotels. We've had wonderful luck using Homeaway.com to find suitable accommodations that fit our needs and price range. This year, we stayed in a 3 bedroom 2 bathroom cabin, complete with a hot tub, & game room with a ½ basketball court for $540 for the weekend. Not too bad when it's split among 7 people! 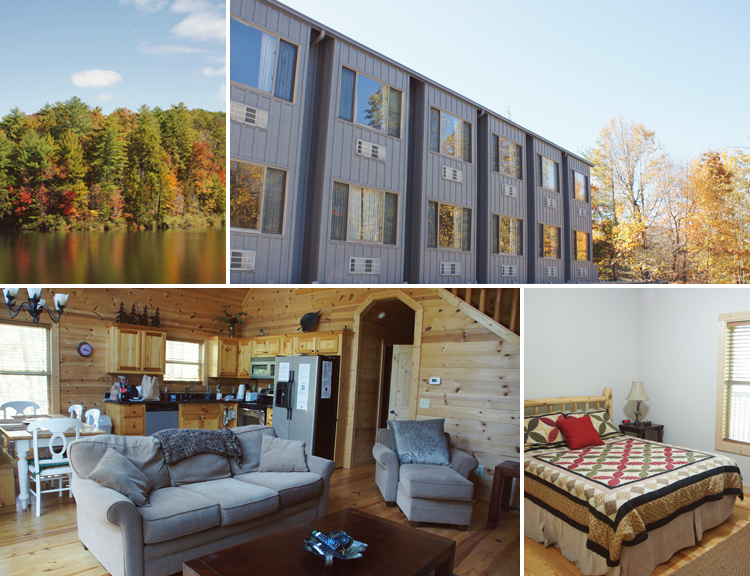 Compared to hotels, cabins are ideal because it's nice to have a home base where you can prepare meals, and have a place to continue the evening once the town has shut down. 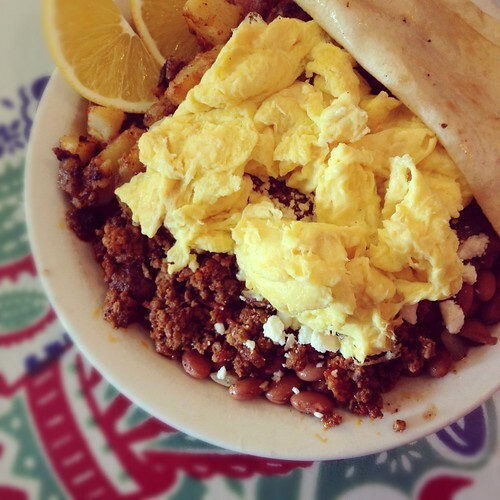 There are a ton of options to choose from when looking for a place to refuel. The problem, though, is finding a place with good food. One of my new favorite places to eat in Helen is Cafe International. It has outdoor seating, and is right along the Chattahoochee River. I recommend the Rueben Sandwich, which I spent an entire year craving since our last visit. The flavor is amazing, it's easily one of the best Rueben's I've ever eaten. One place that I will tell you to pass on is the Troll Tavern. I don't usually include the places I don't like in my blog posts, because I like to keep things on a positive note, but this place is truly disappointing. Yes, we've eaten there for the past 4 years, but we didn't know any better. Our entire table left dissatisfied with our meals this time around. If it weren't for our capable waiter, this place would have no redeeming qualities to speak of. Another notable eatery includes Jordano's, which offers pizza, mostly. What's nice about this place is that it's along the river. Our pizza was ok, nothing spectacular. 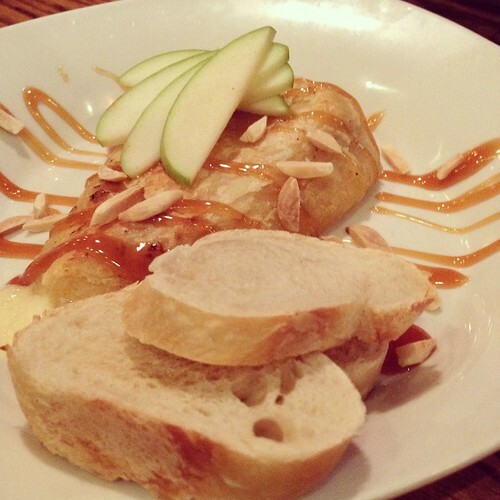 If you're not looking for German-fare, this would be a good spot to go. 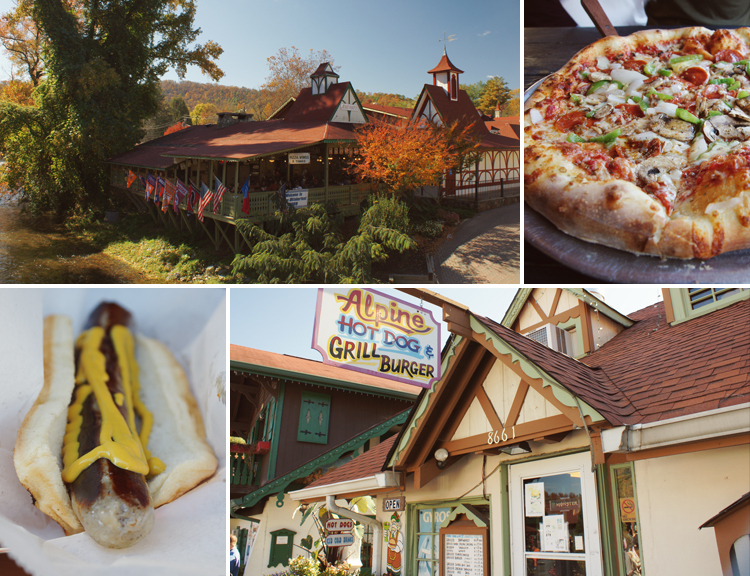 For a quick bite, Alpine Hot Dog would be a safe bet. They have a decent selection of moderately priced options to choose from, like a Grilled Bratwurst or Gyro Wrap. It's fast because you can order right from the sidewalk through their take-out window, and eat on the go. Our food was ready in no time! 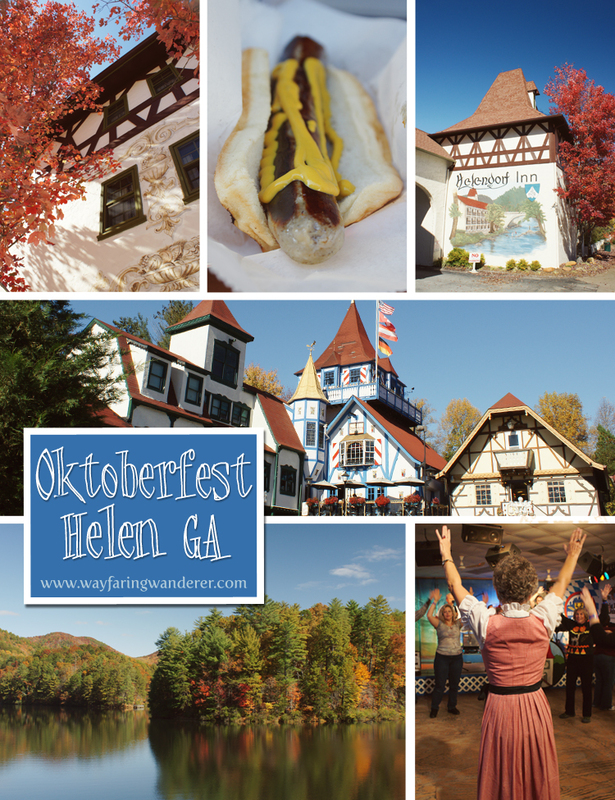 What's left to cover when it comes to Oktoberfest in Helen, Ga? Oh, yeah, DRINKING! While there are many things to do in Helen, GA, it seems like one of the most beloved past times there is drinking. One of the best places to do that is at Festhalle! Festhalle is operated by Helen's chamber of commerce, and it's one of the biggest and most festive venues around town to hang out and have a good time. Depending on when you go, the place can be cluttered with wall-to-wall people. However, there are rows and rows of cafeteria-style tables to take a seat at. Lines for food and beer can often be long, and the dance floor can be just as scattered, but it's the atmosphere in this place that's the real draw. It's always lively and full of people having fun. I doubt that you can escape the lure of doing the chicken dance no matter how silly you look doing it. 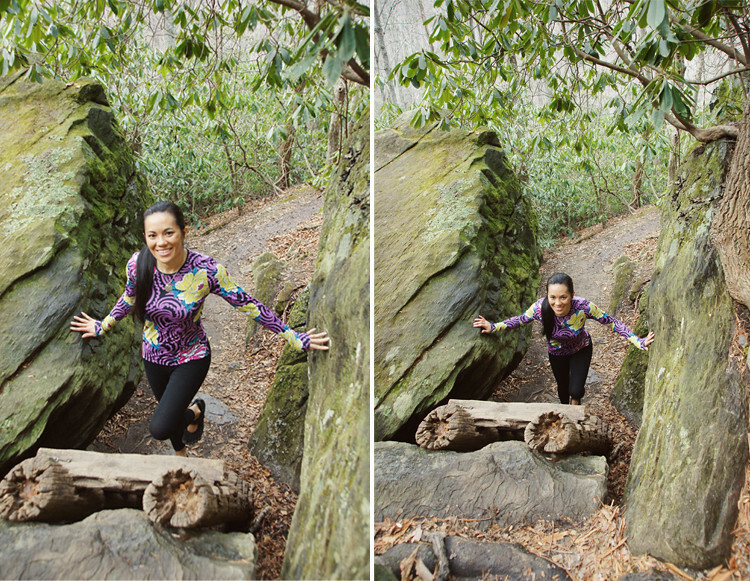 Now, if you don't have a hangover from partying too hard the night before, I highly recommend taking the time to explore the nearby Unicoi State Park where you can take an easy hike up a concrete path to Anna Ruby Falls, a 150ft double waterfall. There's also a nice hike that meanders around the lake if you're looking for a leisurely stroll to take in the surrounding scenery. Other outdoor activities are plentiful in this area as well, so don't miss out on those! If you'd like to find out more about Helen, GA, here is a link to the website. What do you think about the look of Helen, GA? Is it a place that you'd like to go? Please share in the comments or on Facebook! October has been one crazy, fun-filled month! 3 out of 4 weekends have been spent out of town. We're actually going to be home this weekend, thankfully. I'm really happy that I don't have to worry about packing and other preparations to leave town, it'll be nice to wake up in my own bed—whenever I please—on Saturday morning! So far, the only thing I have shared with you is my experience at The National Beard & Mustache Championships in Lancaster, PA, which was an absolute blast. 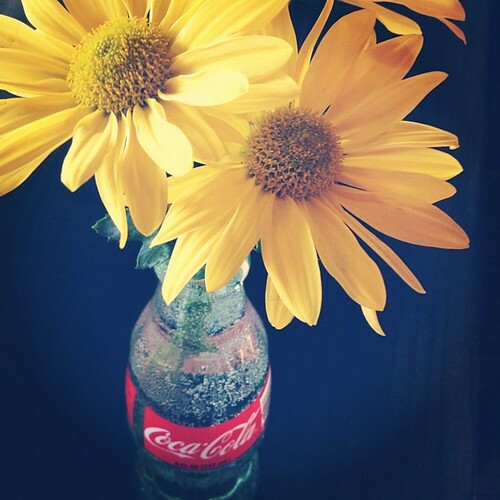 If you missed that post, you should definitely check it out! What would you like to see first? Refer to the photo above! Let me know by casting your vote in the comment section here on the blog. Or you can share your choice on the WW Facebook page.